Human Action—a treatise on laissez-faire capitalism by Ludwig von Mises—is a historically important and classic publication on economics, and yet it can be an intimidating work due to its length and formal style. 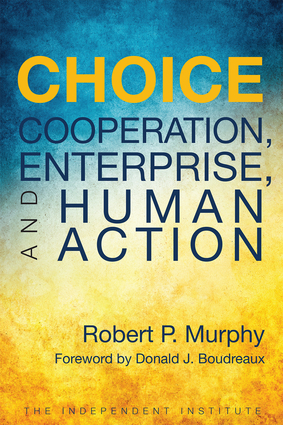 Choice: Cooperation, Enterprise, and Human Action, however, skillfully relays the main insights from Human Action in a style that will resonate with modern readers. The book assumes no prior knowledge in economics or other fields, and, when necessary, it provides the historical and scholarly context necessary to explain the contribution Mises makes on a particular issue. To faithfully reproduce the material in Human Action, this work mirrors its basic structure, providing readers with an enjoyable and educational introduction to the life's work of one of history's most important economists. Robert P. Murphy is Research Fellow at the Independent Institute. He received his Ph.D. in economics from New York University and was formerly Visiting Assistant Professor of Economics at Hillsdale College, Visiting Scholar at New York University, Research Analyst at Laffer Associates, Chief Economist for the Institute for Energy Research, and Senior Fellow in Business and Economic Studies at the Pacific Research Institute. His popular articles have appeared in the Los Angeles Times, Detroit New, Washington Times, Orange County Register, Atlanta Journal-Constitution, MarketWatch, Buffalo News, San Jose Mercury News, Barron's, Forbes, and Investor's Business Daily. In addition, he has appeared on CNBC, Fox Business Network, C-SPAN, and other TV and radio networks and programs. Donald J. Boudreaux is Research Fellow at the Independent Institute, Associate Editor of The Independent Review, and the Nelson Getchell Chair for the Study of Free Market Capitalism in the Mercatus Center at George Mason University. He has been President of the Foundation for Economic Education and Associate Professor of Legal Studies and Economics at Clemson University. His articles have appeared in the American Spectator, Investor's Business Daily, Journal of Commerce, Wall Street Journal, and Washington Times, as well as in such scholarly journals such as the Antitrust Bulletin; Journal of Money, Credit, and Banking; Southern Economic Journal, and Supreme Court Economic Review.